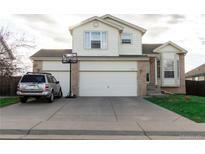 Below you can view all the homes for sale in the Sterling Hills subdivision located in Aurora Colorado. Listings in Sterling Hills are updated daily from data we receive from the Denver multiple listing service. To learn more about any of these homes or to receive custom notifications when a new property is listed for sale in Sterling Hills, give us a call at 720-580-6694. Hurry don't miss this great Home MLS#8922682. Brokers Guild-Cherry Creek Ltd.. Located in desirable neighborhood, conveniently located around the corner from a park and with partial mountain views. MLS#7585361. The Berkshire Group. Hurry! It won't last long! ! MLS#1923635. Colorado McDonald Team LLC. Walking distance to the new Central Rec Center opening soon! MLS#4175040. COLDWELL BANKER DEVONSHIRE. Call today for your private tour. MLS#5735331. True Realty, LLC. Don't Miss out, schedule your showing Today! More Photos coming soon! MLS#5672789. The Nevarez Group LLC. Easy commute to Buckley AF Base, parks, reservoirs, golf, shopping, DIA and major highways. MLS#5282399. LIV Sotheby's International Realty. Only 1 mile to the NEW Aurora REC CTR Opening Soon! Don't miss out! MLS#8457558. RE/MAX Synergy. This home is not to be missed, schedule an appointment today for a private showing. MLS#6492236. The Peak Properties Group. Close to Buckley AFB, easy commute to DTC, close to E-470, near shopping/dining, and a mile from the amazing new Aurora Central Recreation Center opening soon. MLS#7828726. HomeSmart Cherry Creek. Great location with-in walking distance to schools and close to parks and shopping with easy high way access. MLS#5008896. Redfin Corporation. Open house 4/6 from 10 to 1 MLS#5943916. Boston Mortgage and Real Estate. Come picture yourself in this home today! MLS#3687525. Priority Properties, Inc.. The unfinished basement allows for ample storage or an opportunity to finish to fit your needs! MLS#1551116. NextHome Altitude. All information to be verified by buyer. MLS#3502648. Keller Williams DTC. Oh by the way because everyone needs to sleep better, a Home Warranty is included. MLS#4845715. HomeSmart Cherry Creek. Close to schools, parks and recreation. Must see inside! MLS#2918466. RE/MAX Alliance. Easy to show! Don't miss out! ! MLS#9494454. Weimer Real Estate Inc.
Come and see how your family can live in this nice Home. MLS#6600476. Realty One Group Five Star. ~ Great yard and walking distance to schools and Great Plains Park and Playground ~ Great Home! MLS#4597091. Supreme Realty Group. Don't miss this great home! MLS#6050451. Brokers Guild-Cherry Creek Ltd..